S3Anywhere is an Amazon S3 file manager for Android devices. It allows managing several S3 buckets from Amazon cloud. It comes with both handset and S3 file managers. It provides download, upload and folder synchronization features. Resume support for download is available. 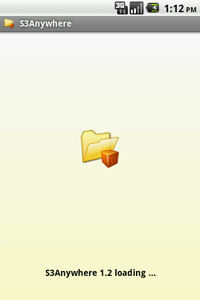 File managers allow renaming, deleting, and copying files. You can view permissions (ACL) on each file. You're ready to access Amazon cloud from Android. What is Amazon S3 ? Amazon S3 (Simple Storage Service) is an online service provided by Amazon.com, that allows anyone (web designers, individuals, companies ...) to store large amounts of data online. AWS S3 bucket file managers. Upload and download with cancel support. Europe (Ireland, Frankfurt), US, Asia locations support. SSE and Server-Side customer key encryption support . List files and folders sorted by name and size. Open file (MP3, Video, Text ...) support on local device. Permissions (ACL) viewer on S3 objects. Secure (SSL) S3 connection support. 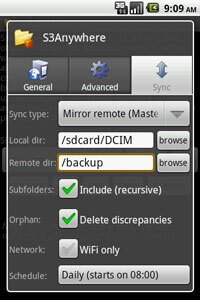 Folder synchronization (mirror remote/local) support. Scheduling support for folder synchronization. Share support (links and gallery). Spanish, French, Japanese translations added. - Server-Side customer key encryption added. Can I use HTTPS to connect safely to Amazon S3? How to connect to a public bucket ? A public bucket has read/write permission for anyone. Fill in the bucket name parameter in S3 settings and leave KeyId and SecretKey empty. I get "NoSuchBucket" error, what did I miss? This error means that the bucket name you've setup in S3 settings doesn't exist. You may made a typo. Check the bucket name. I get "InvalidAccessKeyID" error, what's wrong? This error means that KeyId you've setup in S3 settings doesn't exist. You may made a typo. Double check it. I get "SignatureDoesNotMatch" error, why? This error means that SecretKey you've setup in S3 settings is not correct then your signature doesn't match with the one computed by Amazon S3 server. You may made a typo. Double check it, pay attention, it's case sensitive. I get "Received redirect response 301 Moved" when connecting to ASIA bucket, why? S3Anywhere free works only with US buckets, you need S3Anywhere Pro for Europe, Asia and US west buckets. If you get this error with S3Anywhere Pro then it might mean that you've just created the bucket, wait a few minutes/hours and try again. How can I use import from file feature? What are the differences between S3Anywhere (free) and S3AnywherePro? - Europe, Asia and US West bucket location. I've purchased S3Anywhere Pro, where is my activation key? You don't need activation key when you purchase from Google Market. Activation key is for customers that cannot purchase from Google market. I cannot change directory when I setup remote folder? Did you start the remote folder with / ? If you want to setup myremotefolder then fill in /myremotefolder and it should work. How to synchronize a full bucket? Select / for remote folder in sync tab and select /sdcard/yourfolder for local folder.